Printable-Party.com grants all purchasers a One-User license for personal, non-profit use only. Purchased PDF files can be viewed or printed using the newest version of Free Adobe PDF Reader for unlimited printing use. We cannot offer No refunds or exchanges when purchasing instant download digital goods. Please make sure you order exactly what you'd like before purchasing. 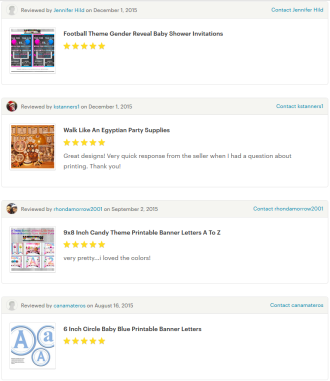 All of the PDF files that are purchased from Printable-Party.com are made for personal use only. This means that you can only use the purchased files for your own personal use & decoration styling. 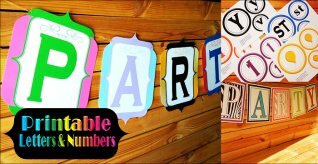 You can use them within your place of business, home parties, events, classrooms (To decorate walls, for office parties etc.) as long as the printables are used in this manner & are not offered in exchange for any money or compensation. All Printable-Party.com files are sold exclusively on this site only. If you see our files being sold elsewhere, please Contact Us with the information and we will compensate you with a few freebies. Personal use only... means you are NOT allowed to make any profit/money from our PDF files or from any items that you print from using our PDF files. Any Sharing of our purchased Digital PDF files is prohibited. Any Selling of our purchased PDF files is prohibited. Any Selling of printed items from any of our purchased PDF files for profit is prohibited. You MAY NOT use the art/images within our studio, website, printable files or photos for any business marketing material such as logos, website content, etc. You MAY NOT use our files to create & offer any tangible or digital products for any business or website. This restriction also includes creating cakes, cookies, sugar art , etc. using any graphics within our files. You may not copy & paste words/content, photos, or reproduce any thing from this website in any way, shape, or form without express permission of Printable-Party.com. 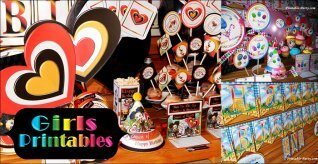 Important: Any purchaser of our printables wanting matching baked goods for their personal non-commercial occasion can have their baker or sugar artist create foods using the elements from the purchased printables to mimic onto food items. Graphics, templates, written works, & photography seen in our PDF files and on this website are copyright. 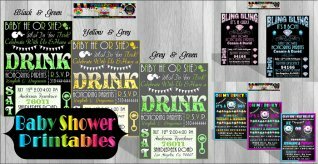 Some graphics in party printables & on this website are created & copyright by Printable-Party.com. Some graphics on this website are not ours to claim ownership of, but only to use in our printable party designs & the copyrights to the images remain with the respected owners who are truly amazing at designing. We only have the rights to use the graphics in our end results of printable designs & printable pages etc etc... The copyright is not transferable to purchasers of our PDF FILES or users of our website. 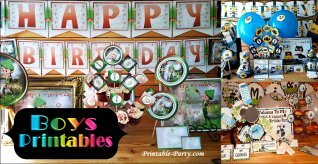 All of our printables contain a small Printable-Party.com logo or stamp on each of the individual PDF file pages and sometimes, within the actual printed product itself. Printable-Party.com grants permission to print purchased PDF files at any print shop. You can upload the files to any of the said print service companies for unlimited prints. Printable-Party.com assumes no liability for any content herein. 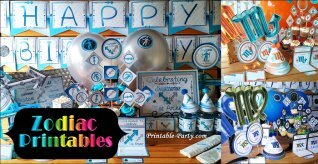 Please use your discretion when assembling any Printable-Party.com DIY crafts with children and please use proper safety guidelines when using any crafting tools or sculpting supply with children.